On Thursday my wife and I drove to my brother's home in Wiltshire. 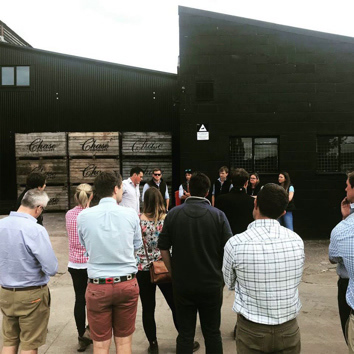 On Friday I was up early and on the road to Herefordshire joining my Under 40's friends as they held an 'interim' meeting before next year's U40 Conference. The first visit was to Freshfields an intensive business growing strawberries, asparagus and garlic. Freshfields manager Jim White welcomed the young U40 members and gave an overview of the business. 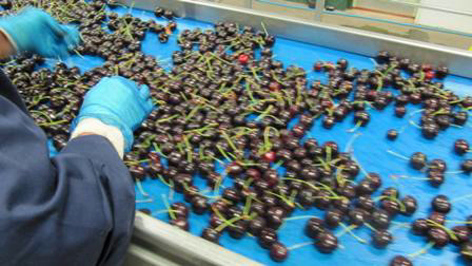 Freshfields speciality is growing fresh produce for supply to supermarkets. Freshfields was started in 2009 and since then has seen considerable expansion and diversification into other crops. Part of a diverse group of businesses based at Thingehill Court which include both agricultural and technical sales/support. Strawberries is the primary business and started in 2009 - all produce is packed, marketed and distributed through S&A Produce - Customers - Tesco, Morrisons, Asda, Aldi and Lidl. Freshfields diversified into Asparagus in 2015 - Packed, marketed and distributed through S&A Produce - customers Tesco and Morrisons. In 2015 we rented an old crop in Herefordshire which was coming to the end of its commercial viability; in 2016 we started a 3 year phased planting programme (finished in April 2018) at a site at Worcester. First crop was in 2016 - a resounding failure!! Undeterred and following investment we went on to produce an average crop in 2017. Operating since 2009 - Nunnington was built in 2010/11 with the view that sustainable strawberry production would be driven through investment in substrate growing systems. Sustainable site - rainwater harvesting, capture of drain water, stone roadways and enhancing biodiversity are guiding principles. In 2016 & 2017 a further site was built 0.5 miles along the road. 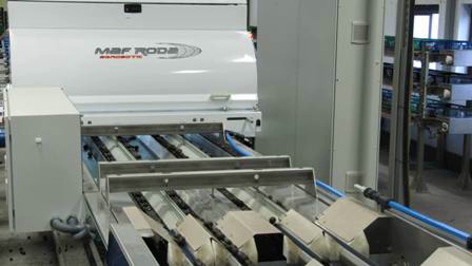 Now all production is in substrate production under protective structures. 2017 was the last year growing in the soil. Generally a complex cropping system!! Jim said; "we rely on a mix of Everbearers, June bearers, varietal selection, delayed planting windows and nursery production areas to spread production & optimise yields, all designed to structure output. The goal to achieve the highest yield per hectare, while controlling our costs per hectare! Substrate boxes are used to enable moving crops - each site is fertigated from one of 2 central pumphouses - delivered to the root zone using drippers and dripper stakes. A sustainable labour source and Exchange rates; BREXIT? Availability of new varieties & plant material; Freshfields do not have access to varieties licensed to large marketing groups. Changing expectations of customers - Disease pressure has been high and fruit quality has been inconsistent this year. Increased costs, some influenced by the supply of materials from abroad; 'plants, coir substrate etc. all costing more due to devaluation of the £. Legislation; particularly reduction of available crop protection materials. Like many growers, the concern for future availability of harvest labour is a real worry! Our future - what we are working towards.. Ultimately we are trying to get better at what we do!! 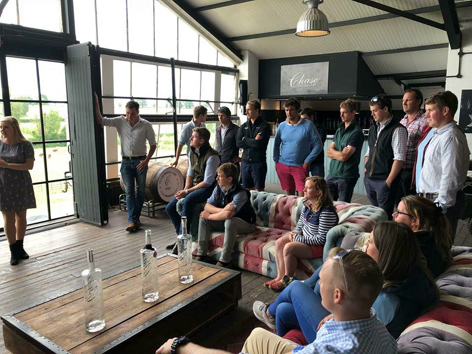 Our second visit was to Lower Hope, where following a buffet lunch, U40's 'recently married' Chair Emily Cliff (formerly Livesey) and fruit manager at Lower Hope updated the assembled U40 members on the planning process for the 2019 Under 40's Conference in Chile. Lower Hope Fruit is part of the 2,000 acre Lower Hope Estate owned by Clive Richards who bought the estate in 1985. Lower Hope Fruit Farm had been a fairly traditional fruit farm, growing apples and still grows Bramleys and Opal apples. 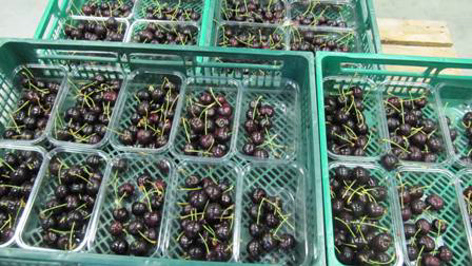 Lower Hope is strategically well placed for cherry production as it is the latest cropping site in the country (England) avoiding the UK cherry production peaks. 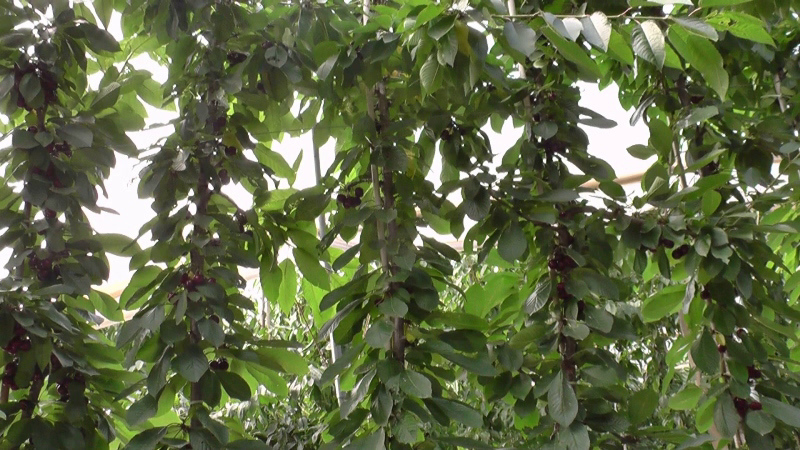 Cherry varieties grown at Lower Hope: Early - Stella, Summer Sun, Lapins, Sylvia and Colney, followed by Kordia, Karina, Regina, Sweetheart, Skeena, Centennial and Penny.. Some Sweetheart are grown on Gisela 6 but most varieties are on Gisela 5. Lower Hope employ mainly Romanian and Bulgarian harvest workers, with circa 200 at the peak harvest time. Lower Hope also grow raspberries: Maravilla on Primocane and Floricane covering an area of 5 hectares. harvest from June/July - on the U40's visit the odd red berry could be found. As the U40's toured the cherry orchards, Ed Turner one of Emily's team at Lower Hope explained the irrigation system operated from the pump house on higher ground. We also looked at the one hectare trial block, where a number of varieties (from early to late) are growing on intensively planted 'super spindles' - the 'trial' planting distances are: 0.5 metre (in the row) x 3 metre (between the rows) & 0.75 metre x 3 metre - a third trial has been planted with 'twin leader' trees. An important aspect of tree management is dealing with the tops, which can get very 'growy' - this is best managed after harvest; the tunnel covers are removed as soon as harvest (for a variety) has finished. This means from late July the process of removing strong growth in the the tops is followed by removal of covers soon after. The process is complete by the end of September. Emily explained the importance of not allowing the branches to grow to long; the ideal is renewal of the short, downward facing fruiting units ensuring the fruit is growing near to the main stem. Reflecting back to the springtime: the tunnel covers go on from early March until mid May (depending on the variety) it is not possible to start before then due to windy conditions - blossom time starts in early April. The trial trees are planted on ridges with irrigation tubes laid beneath the plastic mulch. The ridges aid drainage and create a healthier root zone. To accommodate the taller (super spindle trees) the tunnels have a Y leg with straight extensions pushing the curved tunnel framework higher. It is well worthwhile following Emily's Concept Cherry Orchard video for a better understanding of the objectives. 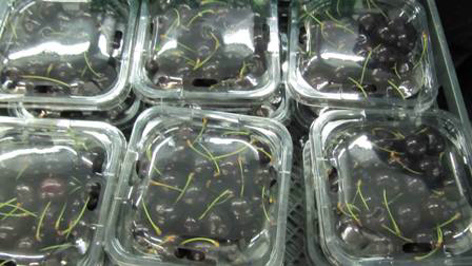 From the cherry production tunnels, the fruit makes a short journey to a 'state of the art' grading line. 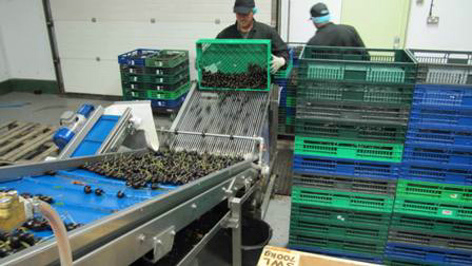 At a cost running into seven figures, this cherry grader can size and select cherries into the required customer specification and recognise and reject inferior fruits. The Packhouse visit was conducted by Hayley Gilchrist. At this point the English Apple Man left his young friends and headed back to Wiltshire. 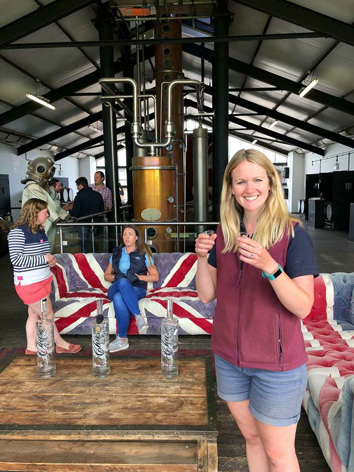 The prospect of visiting a distillery for an opportunity to indulge in 'tasting' and then driving for two hours, inspired a dose of common sense. 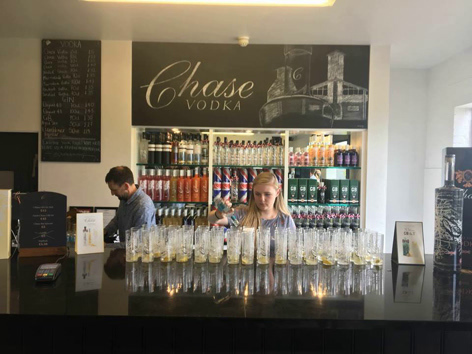 For the full story: click on CHASE DISTILLERY a truly inspiring story of creating an added value product from such a basic raw material. Time to bring this week's Journal to a conclusion....it's 11.30pm on Friday evening and time for bed!